HOLY COW! Brian and Erin Anderson have been welcoming people from all over the globe to visit their Dairy Farm in Langley, B.C., since 1999. Schools, Groups and Families have all come to enjoy a real working dairy farm in action and learn about (or help) with the daily chores. With the move in late 2017 to a beautiful acreage closer to Fort Langley a new name for our farm was needed! Brian grew up on the Aldor Acres Farm and was very involved in the management and development of the Pumpkin Patch and the Christmas Tree Farm. 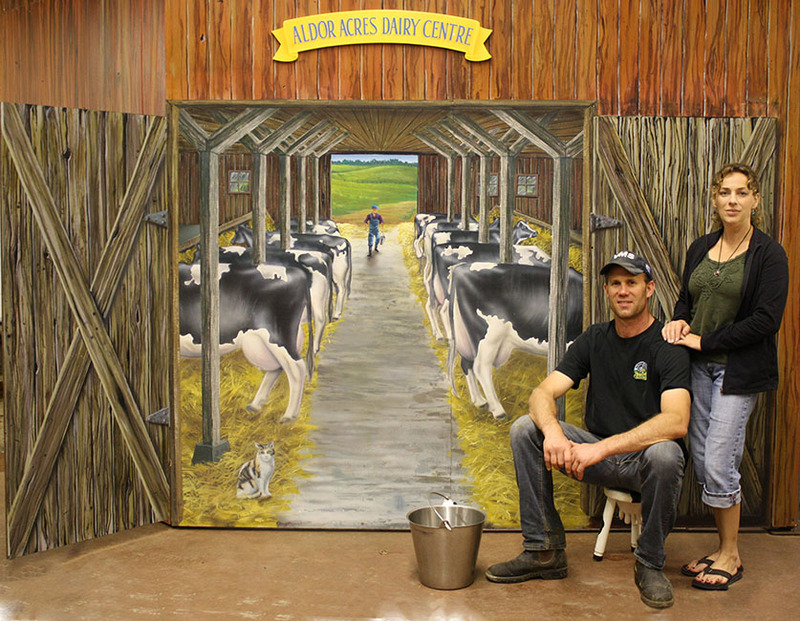 Erin grew up on a dairy farm in South Surrey and joined Brian in 1994, and together they created the Aldor Acres Dairy Centre, now Eagle Acres Dairy. They started milking in 1999 with 11 cows in a herringbone milking parlour. They are now milking 60 cows daily with a Robotic (VMS) milking system. Their children help with the daily chores and are often ‘auxiliary’ tour guides with the afternoon family tours. In October 2018 they opened the Eagle Acres Pumpkin Patch with the goal of keeping the animals and guests all calm and safe during their visit to the farm and pumpkin patch. The barn and courtyard area were designed to be free of vehicle traffic. The animals on this working farm are for education, visiting and interaction while respecting the animals personal space and therefore not causing mental stress. The covered hayrides to the pumpkin patch are loaded in an orderly fashion and are enclosed by wire mesh providing safety and security for not only the children but their parents and teachers peace of mind as well! They are a local, sustainable and passionate Canadian family farm. They enjoy what they do and always like to share their day with visitors!